Last week, some colleagues and I were pondering the difficulties many middle school students have solving ratio and proportion problems. Here are a few thoughts we developed to address this and what we think might be an uncommon graphical extension (for most) as a different way to solve. For context, consider the equation . While this delivers a quick solution, we sadly noted that far too many students don’t really seem to know why the procedure works. From my purist mathematical perspective, the cross-multiplication procedure may be an efficient algorithm, but cross-multiplication isn’t actually a mathematical function. Cross-multiplication may be the result, but it isn’t what happens. In every math class I teach at every grade level, my mantra is to memorize as little as possible and to use what you know as broadly as possible. To avoid learning unnecessary, isolated procedures (like cross-multiplication), I propose “fraction-clearing”–multiplying both sides of an equation by a common denominator—as a universal technique in any equation involving fractions. As students’ mathematical and symbolic sophistication grows, fraction-clearing may occasionally yield to other techniques, but it is a solid, widely-applicable approach for developing algebraic thinking. From the original equation, multiply both sides by a common denominator, handle all of the divisions first, and clean up. For our example, the common denominator 24 will do the trick. Notice that the middle line is precisely the result of cross-multiplication. Fraction-clearing is the procedure behind cross-multiplication and explains exactly why it works: You have an equation and apply the same operation (in our case, multiplying by 24) to both sides. As an aside, I’d help students see that multiplying by any common denominator would do the trick (for our example, 12, 24, 36, 48, … all work), but the least common denominator (12) produces the smallest products in line 2, potentially simplifying any remaining algebra. Since many approaches work, I believe students should be free to use ANY common denominator they want. Eventually, they’ll convince themselves that the LCD is just more efficient, but there’s absolutely no need to demand that of students from the outset. Remember that every equation compares two expressions that have the same measure, size, value, whatever. But fractions with differing denominators (like our given equation) are difficult to compare. Rewrite the expressions with the same “units” (denominators) to simplify comparisons. Fourths and sixths can both be rewritten in twelfths. Then, since the two different expressions of twelfths are equivalent, their numerators must be equivalent, leading to our results from above. I find this approach more appealing as the two fractions never actually interact. Fewer moving pieces makes this approach feel much cleaner. A fundamental mathematics concept (for me) is the Rule of 4 from the calculus reform movement of the 1990s. That is, mathematical ideas can be represented numerically, algebraically, graphically, and verbally. [I’d extend this to a Rule of 5 to include computer/CAS representations, but that’s another post.] If you have difficulty understanding an idea in one representation, try translating it into a different representation and you might gain additional insights, or even a solution. At a minimum, the act of translating the idea deepens your understanding. One problem many students have with ratios is that teachers almost exclusively teach them as an algebraic technique–just as I have done in the first three methods above. In my conversation this week, I finally recognized this weakness and wondered how I could solve ratios using one of the missing Rules: graphically. Since equivalent fractions could be seen as different representations of the slope of a line through the origin, I had my answer. Students learning ratios and proportions may not seen slope yet and may or may not have seen an xy-coordinate grid, so I’d avoid initial use of any formal terminology. I labeled my vertical axis “Top,” and the horizontal “Bottom”. More formal names are fine, but unnecessary. While I suspect most students might think “top” makes more sense for a vertical axis and “bottom” for the horizontal, it really doesn’t matter which axis receives which label. In the purely numeric fraction in our given problem, , “3” is on top, and “4” is on the bottom. Put a point at the place where these two values meet. Finally draw a line connecting your point and the origin. The other fraction has a “6” in the denominator. Locate 6 on the “bottom axis”, trace to the line, and from there over to the “top axis” to find the top value of 4.5. Admittedly, the 4.5 solution would have been a rough guess without the earlier solutions, but the graphical method would have given me a spectacular estimate. 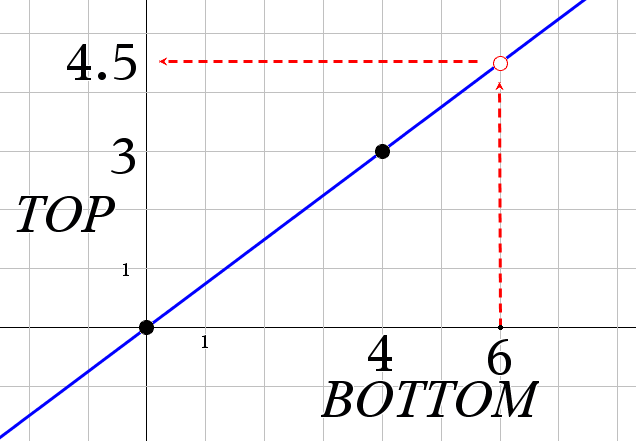 If the graph grid was scaled by 0.5s instead of by 1s and the line was drawn very carefully, this graph could have given an exact answer. In general, solutions with integer-valued unknowns should solve exactly, but very solid approximations would always result. Even before algebraic representations of lines are introduced, students can leverage the essence of that concept to answer proportion problems. Serendipitously, the graphical approach also sets the stage for later discussions of the coordinate plane, slope, and linear functions. I could also see using this approach as the cornerstone of future class conversations and discoveries leading to those generalizations. I suspect that students who struggle with mathematical notation might find greater understanding with the graphical/visual approach. Eventually, symbolic manipulation skills will be required, but there is no need for any teacher to expect early algebra learners to be instant masters of abstract notation. This entry was posted in Pedagogy and tagged cross-multiplication, graphing, lines, middle school, proportions, ratios, rule of four, slope. Bookmark the permalink. I have always used method 2 with my students, but I especially like method 3, because it builds on the basic concept of equivalent fractions, which is the whole point of proportion problems. The graphical approach seems like another “trick” for students just learning algebra because there is no reason a student would think to represent a ratio with slope. But it would be great for students who understand slope. I agree that teaching “cross-multiplication” is problematic because students want to “cross-multiply” any expression that has fractions in it! Arghh! My point in introducing the graphical is to give students who struggle with abstract symbolism another way to approach ratios. But perhaps I jumped a bit too quickly. Now that I think about it, declaring solutions to all lie on a line is indeed the “trick” you suggest if I don’t set it up more. What if students solved 2/3=x/6, then 2/3=x/12, and finally 2/3=x/9. Graph all four resulting equivalent fractions (2/3, 4/6, 6/9, and 8/12) on “top” and “bottom” axes and students should see the line for themselves. So, solving 2/3=x/# where # is any number can be “solved” on the same line. Do other examples to show that the same happens with other forms. The early connection between equivalent numerical, algebraic, and graphical forms would be an invaluable lesson.